Many times we start out the school year with perfectly ordered bookshelves and a shiny fresh start with our homeschool organization. By the time we are on the home stretch looking at spring, that order is a distant memory. The schoolroom slowly gets more and more disorganized. School must go on though, but it goes so much smoother when I am organized. I’m making it a priority over the next few weeks to declutter, and organize our learning spaces. It’s important to me to have a variety of resources available for my children, and to have a lovely learning environment, so I’m excited about getting it whipped back into shape. Our shelves are organized by subject, one for arts and crafts, another one for history resources, and another for science. I also have a shelf of our Peaceful Press teacher books and resources. Towards the end of a school year, I will cull the shelves for unwanted titles, and switch out our display books for new selections that correspond with our upcoming studies (this year it will be choices from The Kind Kingdom book list). In addition to all the books, I like to have easy access for my children to markers, colored pencils and stick glue. In this way they can put together creative notebook pages, or quickly make a greeting card without having to ask me for supplies. I keep most of these supplies in a caddy in the middle of our school table, but several times a year I sort through each jar full of pencils, brushes, and pens to toss broken bits and resharpen pencils. While there are tons of books to reshelve and organize, and pencils to sharpen, we can also get inundated by all the papers. Throughout the school year, I simply place finished work in a folder in each child’s school file. Then, at the end of the year, I will save a couple for their books, and toss the rest. Many homeschool cover schools require a few work samples per semester, and we try to keep at least that many in a file. School at home can be so much fun, but one important aspect is taking the time to prepare your home to be a place where children can focus on their work, find supplies, and do the research they need to do, in order to be well prepared young people. Organization isn't just about having a nice looking room, it is also teaching our children good mental sequencing skills and making our homes more functional places to learn. Brother Label Maker-label your shelves and supply boxes to streamline clean up. Wide Mouth Mason Jars- cheaper at a local hardware store, but great for organizing paint brushes, pencils, and markers. We use the shorter ones for crayons. Silverware Caddy-we keep a caddy similar to this one for storing all writing/painting/drawing implements. Bookcase-our hall closet contains an 8 cube bookshelf for storing and organizing books by subject. A former home had multiple built in bookshelves, a home educators dream, but we make do now. What are your best tips for organizing your homeschool area? Click here for a favorite blog and A view of a well organized school room. For one weekend in May, you can get a whole bundle of home organization and decluttering resources at a steep discount. Click here to learn more. We are excited to introduce the book list for our newest resource, The Kind Kingdom, which will be available in May. This resource will provide a 30 week overview of European history, using the Narnia books, Grimm’s Fairy Tales, and Beautiful Stories From Shakespeare as a spine. The Kind Kingdom could be used along with Classical Conversations Cycle 2, or as a stand alone Charlotte Mason inspired resource. As with our other resources, The Playful Pioneers and The Precious People, The Kind KIngdom includes Bible, language arts, science, history, art, practical skills, and cooking. We also include a monthly hymn, and bi-weekly poetry selection. The student sheets include mapwork, and copy work corresponding with our Bible or poetry reading, along with quotes from inspiring people in history. If you disagree with the order, and prefer to read The Lion, The Witch, and The Wardrobe first, feel free to do so. The Narnia readings can stand alone without affecting the flow of the curriculum. As you read through the book list, you will see that each month has a theme. This is to allow you to approach it as a block study, and to give you a framework for extra reading over the time period. You can easily find all of the books on Amazon (links are included) but we hope that families will borrow books from their local library, and you are free to substitute any of the science and history books for another book on the same subject. For instance, if the subject is Gutenberg and the printing press, you can find a different book about it, or even search a Youtube video for kids about it. While we aim to make reading the larger part of our homeschool routine, one of the benefits of living in modern times is the ability to not just read about a subject, but to actually see the workings of machines, and nature, through the many amazing educational videos available. We recommend limiting screen time to allow for reading and imagination to develop, but interjecting a few minutes a day for educational videos is a fantastic use of technology in our opinion. The Holy Bible This link has a $10 version, but you probably have one at home..
Kings and Queens of England and Scotland by Pamela Egan Prime for 9.99, used for $5. Our Island Story by H.E. Marshall 15.83 Prime, .99 cents on Kindle, also available free online. Fine Print by Joan Johansen Burch 9.99, 1.25 used, this is a short chapter book about Gutenberg. I also loved this picture book version if you can find it. So how much does the curriculum cost? Well, if you were able to find none of the books at the library, and no substitutes, you could still purchase all the books for around $300 for used copies, and build an impressive home library in the process. That, in addition to the $49 for the parent guide, student sheets, art, and recipes, plus whatever resource you are using for math or phonics would make a complete homeschool plan for the year. However, we’ve organized the curriculum in such a way that you can easily do it with a very slim book budget. Each month has a theme and so if you are on a super tight budget, you can borrow the Narnia books from the library, read the free online version of Our Island Story, and even find free online versions of the Grimm’s Fairy Tales and Beautiful Stories From Shakespeare. Then, you just borrow books from the library that fit the theme for the month. If we are studying the Queens and Kings of England, ask your librarian for a stack of books on the subject, read those books that engage you, do the projects in the parent guide that correspond with the theme, and enjoy diving into history with your children. Our resources are meant to bring families closer together, to spark new areas of interest, and to spread a feast of learning before your children that inspires them to dream big about how they too can impact the world for good. Please e-mail us with questions as you get started, hello@thepeacefulpress.com. Homeschooling with The Peaceful Press is meant to be life giving for parents and children. We offer lesson plans that provide a framework, but that don’t overburden families, so that you and your children can chase the spark of ideas and imagination together. 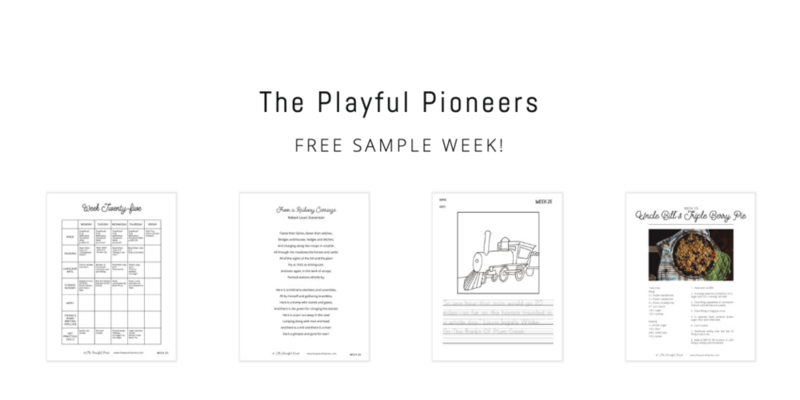 Below you will find one day of lessons from our sample week of The Playful Pioneers. Take a break from your regular homeschool program to observe your children as you provide a framework of literature based activities, while also offering some free time for them to develop interest led learning. Point out that Laura was describing things for Mary who could not see. Act out that part of the story and take turns describing your surrounding for each other. Read Locomotive by Brian Floca. Add a train drawing to your notebook, along with notes about steam propulsion. When you have finished with a simple day of lessons with The Peaceful Press, take a few minutes to observe your children, and take note of the ways that they continue engaging with the content in their free time. Learning to observe your child can help you see how much they have actually absorbed. Would you like to try a free week of The Playful Pioneers? You can download a free sample and enjoy! We’ve have a new guide here at The Peaceful Press and we are excited to share it with you. Spring is here and we have combined this wonderful season with a focus on the outdoors and gardening. This four week guide will delight you and your young child with its engaging literature selections, fun activities for developing motor skills, recipes and hands on application out in the sun. As we head towards the warmer seasons it can be hard to keep going through the homestretch but adding in interest led studies can help your children renew their love for learning, and keep developing skills while enjoying the hands on fun that leads to a gentle approach to homeschooling for the whole family. In this unit you will find a basic introduction to gardening, including beautifully illustrated living books that bring the garden to you, as well as activities and life skills that bring the fun of the garden to your home. Lisa Wilkinson again contributed her amazing ideas to this guide, and the collection of books she curated is a lovely way to introduce young children to the beauty of the garden (click for Amazon link). We hope you can find most of these at the library, but feel free to substitute if necessary. Lisa also offered a bonus lesson based on the book, The Tiny Seed by Eric Carle. Make a Tiny Seed sunshine craft-In The Tiny Seed by Eric Carle you will notice that bright shining sun. You can take time to talk about how the growing seeds need that sunshine and create a paper plate sunshine to remind you what your plants will need. Paint a paper plate a bright, sunshiny yellow. Next, add yellow, orange, and red strips of construction paper to the outside of your paper plate to create sun rays with a glue stick or stapler. Field Trips are another important part of learning with preschoolers, and the garden guide sparks some wonderful field trip ideas. Visit a Local Farm. Discover what is planted in the gardens, how they care for the seeds and plants, and how they share or sell the harvest with others. Visit a local Farmer’s Market. Discover what can be grown and harvested in your area. Try new foods you find as your visit the stands full of beautiful color and variety. Visit a Farm to Table Restaurant. Find out where they source their food locally and what ingredients come from what kinds of farms. We are so delighted to offer you another unit to encourage you and your preschooler to grow together! Happy Gardening! This post contains affiliate links. Thanks for clicking through and showing your support. When I was a little girl I would often look to escape, whether into the woods to build industrious forts or into the wondrous, intricate writings of Laura Ingalls. So when I was introduced to the Peaceful Press through my Instagram family, I was delighted! It has been such a nourishing addition to our family rhythms. Fitting in perfectly with our love of outdoor adventure, and fruitful, enriched learning, the curriculum is brought to life through wonderful literature, art and handcrafts. I completely agree, and this curriculum makes it easy to follow an interest led approach full of multi-sensory, learning fun! Reading and writing came naturally to me, so watching my oldest and youngest struggle with it was discouraging. After years of intervention with my oldest, he was finally diagnosed with Orthographic Dyslexia. This means his brain has trouble processing the relationship between spoken and written language. Since there is a genetic component to it, and I am seeing similar signs, it would be a safe to say that my youngest does too. Fear not! She is an incredibly clever girl, creating epic habitats or grand castles out of random trinkets and doodads. She can spot patterns, and tell fascinating stories, but reading and writing were not bringing her joy. These questions, along with the wonderful narrating prompts that are provided on the daily schedule evokes thoughtful conversation. I feel so blessed to share books from my childhood, that encourage respect, hard work and humility. I can see that she is encouraged by Almanzo’s tenacity, and she can relate bashfully when he is mischievous. She enjoys working on the correlating coloring pages along with simple copy work, while I read our chapter, which has been perfect for my reluctant writer! As much as she loves to be taken on adventures through Laura’s descriptive tellings, her absolute favorite part of this curriculum is the handcrafts! We have had so much fun retaining what we learn by using our hands and imagination! I am going to share a few activities that were so delightful for us. Ma Ingalls was a very wise woman knowing the importance of good work habits being embedded into the tapestry of a child’s youth, so the whole family was involved in chores and running the household. One of which was the process of making clothes, from shearing the fleece, skirting the wool (which means to pick out all the organic bits and pieces) washing, then carding, and finally spinning! Olivia was immediately enthralled at the process. I found the sweetest mama on Instagram, Arielle, who sells a beautiful little kit with handmade carding brushes, freshly sheared wool, and wonderful instructions on how to prepare it! We got right to work, Olivia crinkling her nose while picking out little pieces of hay and inquiring about the “funny smell” which lead to a discussion about lanolin and how it is used today. The smooth, wooden carding brushes were the perfect size for her to use and she really enjoyed making the wool look like little “clouds”! Much to my disappointment, we do not have a loom to spin the wool into yarn but we were able to wet felt star ornaments and balls for garland, using just some hot water, soap, a fork and cookie cutter! I had mentioned above that Olivia loves to build things, she is a thinker and has such an inquisitive spirit! When we were reading about Almanzo’s ice house we decided to build one of our own! We gathered the tools of the trade ( popsicle sticks, a hot glue gun, and some pine shavings from the chicken coop) then, after concentrated construction, and alternating layers of ice and shavings. It was time to put it outside! Now we did this lesson in October, and we were having unseasonably warm weather so it was in the upper 50’s that day, but IT WORKED!! YAY! I could go on and on, telling of potato stamp art, and watercolor masterpieces in our nature journal, using the beautiful references in Julia Rothmans “Anatomy” series. I have happy tears in my eyes thinking of my girl making bread for the first time in her poncho and sombrero. moments of hysterical laughter while vigorously shaking cream until we both almost faint! My 6 yr old may not show much interest in reading and writing but she can tell you who Benjamin Franklin is and what he added to his kite before he flew into that thunderstorm! She even assembled her own kite and hung it next to her fun timeline card that is provided for a great visual reminder. We have been inspired by poetry and classical art, exploring life with a newly found zeal! 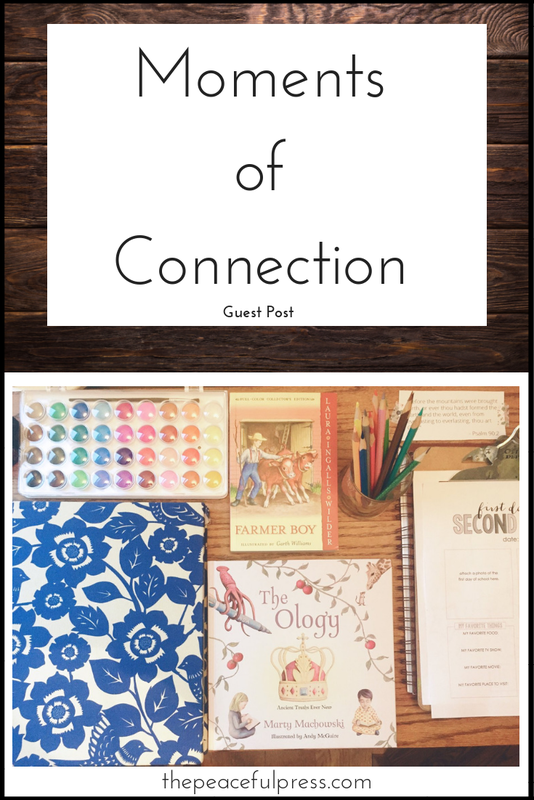 This curriculum has been like a perfectly timed hug, gently guiding us on our journey, introducing us to rich living books and an intentional, thoughtful education. This post has affiliate links. Thanks for clicking through and supporting this site. Although our focus here at The Peaceful Press is helping families homeschool young children, the truth is that children grow, and many of you may be homeschooling young children and older ones, or even homeschooling little ones while mentally gearing up for later. 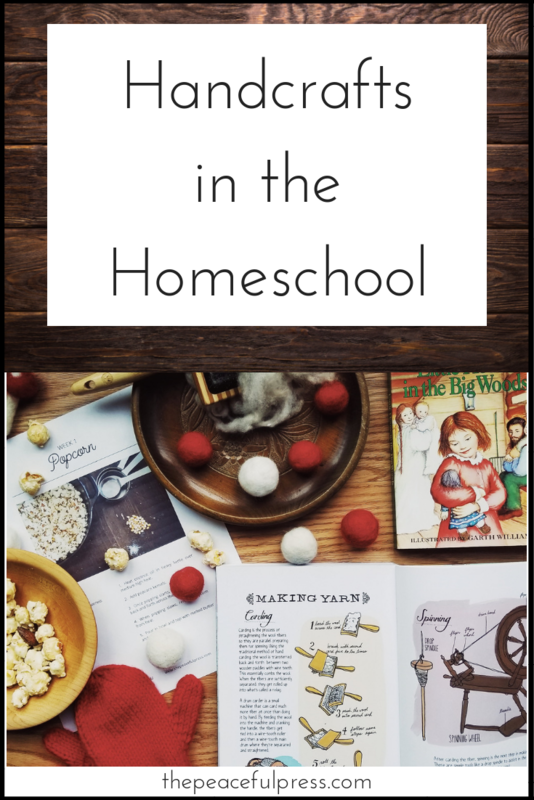 I wanted to share a few resources we have used to homeschool children as they grow into late elementary and beyond. When I wrote The Playful Pioneers, and The Precious People, I kept them open ended in terms of math and language arts so that a family with students of varying ages could use the guide together. One of my major goals with The Peaceful Press is to promote connection among families, and I am convinced that one mama trying to do multiple different curriculums with multiple children will most often result in burnout. My vision is for homeschooling to be fun for the whole family. When I looked carefully at the components of a good education; the kind of education that prepares students for college, or at least prepares them to learn what they want to learn, I found a few important basics. The ability to read information. The ability to retell or communicate information. The ability to think critically about information. Obviously, this is a very basic list, and every family will have a different set of information that is important to them, as well as a different set of values that they want to cultivate. A more in depth definition of a good education is articulated by John Ruskin in his book, The Crown of Wild Olive. In either definition, we should feel permission to devote the elementary school years to learning to read, learning math concepts, and learning to write, and these skills are easy to teach and don’t take all six years to learn. So what should we do with the bulk of our elementary homeschool years? I propose that we should present to our children the idea that we love them, that learning is fun, and that the world is open to discovery. We do this through reading good books together, copying great thoughts together, learning about math together, baking and creating together, and enjoying nature together. Note the emphasis on togetherness, it is intentional because a child who is attached to their parents, who is full of the knowledge that they have parents who love and enjoy them, will be a child who can learn and achieve anything. 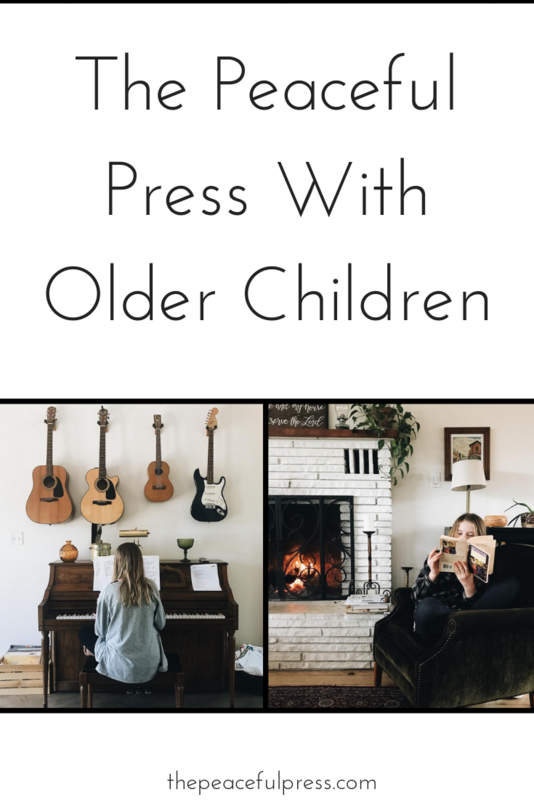 In our home, we follow The Peaceful Press elementary guides with all children who haven’t started college classes (usually my high school students start college classes at the age of 14 or 15). If any of my children are home, they will join us for morning time, reading through The Peaceful Press suggested Bible, history, and literature readings, along with reciting memory work. We leave margin to follow interest led questions and learning, and write down new concepts on our blackboard. While I read aloud, elementary students copy or trace from Playful Pioneers or Precious People student sheets. In our family morning time, we have also added in a daily Spanish language bible story for immersion foreign language, and singing, often with musical accompaniment by one of my children. We also add in interest led literature, science, and devotional reading. Once morning time is over, each child moves on to independent learning while I move between them offering help and support. My elementary students use Teaching Textbooks math once they have worked through the first few levels of Right Start math, we are firm believers in the power that Right Start math has to make math meaningful for young children, but we also love Teaching Textbooks for the accountability and immediate feedback it gives. We’ve also begun using a geometry course by Waldorfish that the whole family is enjoying. For language arts with older children, we start with having them make notebook pages based on our daily readings. This might be a picture and written narration about the chapter we read, or it might be a diagram of something we learned about in Farm Anatomy or another science themed literature selection. We also do a weekly lesson from U.S. History Based Writing Lessons from Institute for Excellence in Writing or Ancient History Based Writing Lessons. I love the way these guides teach basic grammar concepts and an objective way to look at the structure and style of writing. These won’t help your child write beautifully, that comes from reading great works, but it will help you begin to develop the skill of reading material, and then retelling it in your own words, which is one of the components of academic success in college classes (that and a good work ethic). Another component of success in college classes comes from having a well developed vocabulary which is a direct result of reading great books. Instead of assigning particular books for children, I keep a basket or shelf of highlighted books for the time period we are studying. Many of these titles can be found in the Independent Reading List that is included in The Playful PIoneers and The Precious People curriculum. I’ve only had one child that had to be asked to read, most of my children have outpaced me with their appetite for new books, and so I let them choose which books off the list appeal to them instead of assigning books they don’t enjoy. Twice a month I require a longer written narration based on the books they have read. Classical Conversations App-A low cost way to work on memorizing a body of information, and getting an overview of the Classical Conversations memory work. James Stobaugh World History-There are many great resources for giving your older children an overview of world history including the books by Genevieve Foster, A Child’s History of the World by V.M. Hillyer and textbooks like Mystery of History, but this one is a great favorite of mine, partly because he includes women in his list of historical greats, including one of my personal heroes, Julian of Norwich, and partly because he presents events and leaves some of the moral implications for families to sort out for themselves, unlike some of the resources we have used. Audible-We love using Audible for listening to more lengthy books, and for the ability to listen while I join in with painting or knitting, instead of all the reading aloud being my responsibility. We listened to The Children’s Homer, The Bronze Bow, Ben Hur, and The Robe while working our way through The Precious People, and we listened to Shh, We’re Writing the Constitution, Justin Morgan Had a Horse, Across Five Aprils, The Freedom Train, and They Called Him Stonewall, while working through The Playful Pioneers. Khan Academy-An amazing resource for learning anything, and a huge help for subjects that you get stuck on. This post contains affiliate links for products we love and use. As we read books to our children, we are not just exposing them to literacy, but exposing them to the world, and cultivating in them a love for others that can translate into world changing actions. 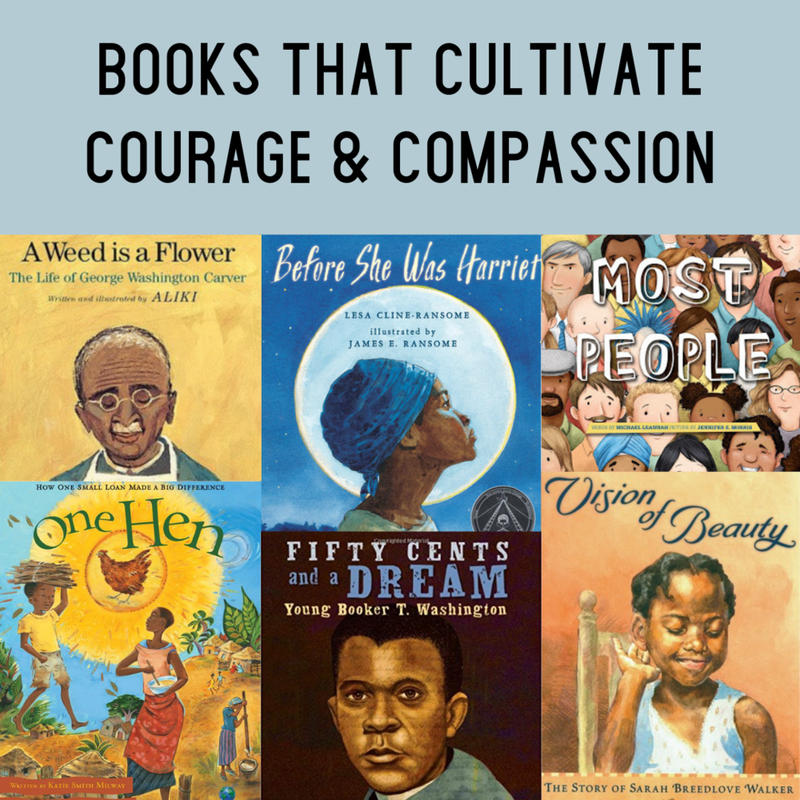 Below is a list of some beautiful books for cultivating courage and compassion, books about people who have overcome difficulties in their life, and books about seeing the best in people. Martin’s Big Words by Doreen Rappaport, illustrated by Bryan Collier- The life of Martin Luther King, Jr.
We’d love to know - what books have infused your family with courage, and inspired more compassion? Check out our new Mountain Guide for around the world preschool learning! Click the button below to download a free sample of our parent guides, children’s activities, printable and book lists to give you a taste of The Peaceful Press Curriculum. This post contains affiliate links. Thanks for clicking through and showing your support. While we think that nothing is better than reading an actual story to your child, you can also find many of these as Youtube read alouds.